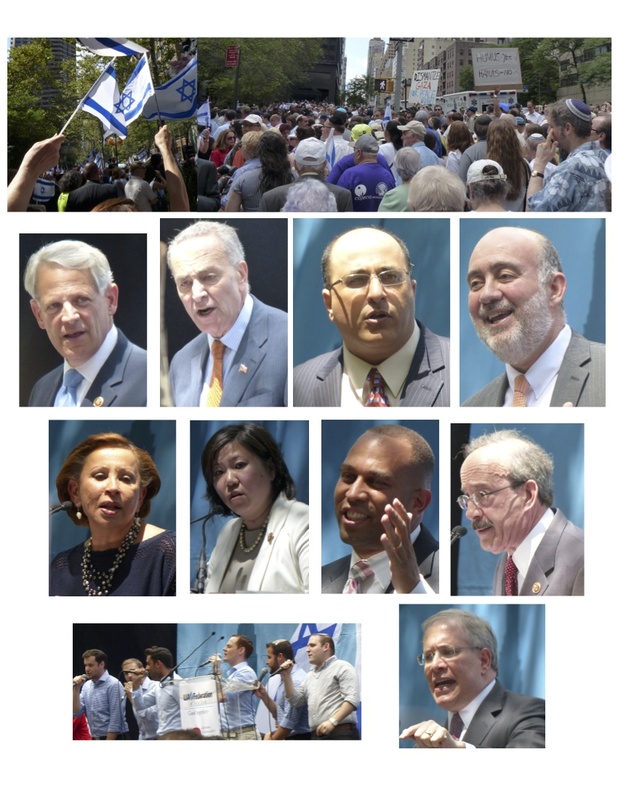 10,000 to 15,000 pro Israel supporters spent their lunchtime today attending a animated two hour pro Israel rally at Dag Hammarskjold Plaza opposite the United Nations. Speakers included: Israel’s Consul General in NY, Ambassador Ido Aharoni, UN Ambassador Ron Prosor, U.S.Senator Chuck Schumer, Congressional representatives Elliot Engel, Steve Israel, Nydia Velazquez, Grace Meng, and Hakeem Jeffries, and local politicians and clergy. New York City’s Comptroller and Manhattan Boro President also addressed the crowd. New York City’s Mayor was not present. Speakers stressed the right of Israel, as any country has, to defend itself from rocket attacks and tunnels and criticized the unfair and biased coverage of Israel’s actions in the war on Gaza. Congressman Engel criticized the media’s biased reporting of the Gaza war. The crowd cheered when he announced that he will introduce legislation to help Israel’s Iron Dome missile defense system. NYC Comptroller Scott Stringer, the highest ranking elected city official present, urged the crowd to defend Israel on social media. Other speakers pointed out the cowardice of Hamas military leaders who command their troops from the safety of fancy hotels in foreign countries. By contrast, Israeli commanders personally lead their troops. Furthermore, as Hamas “fighters,” aka terrorists, do not wear uniforms, the distinction between civilian and terrorist is blurred. Is a man who wears jeans and a t shirt, but fires a weapon, a terrorist or a civilian? Hamas’ decision to use concrete to build underground tunnels, rather than houses and bomb shelters was denounced. While sympathy was expressed for the innocent civilians on all sides who have been killed, blame was placed on Hamas’ doorsteps for fighting from congested areas, instructing people not to heed Israeli military warnings, and using civilian buildings, such as hospitals, schools, and mosques as weapons storage facilities and points from which to shoot. Speakers expressed thanks to the United States government and its people for their staunch support of Israel and the Iron Dome project. The Maccabeats, a Jewish acapella group, entertained the crowd with a number of Jewish songs. Attendees included Jews from all streams of Judaism, as well as many non Jewish supporters. A small number of pro-Palestinians held a rally across the street.